Standing in the heart of the city, the sprawling Ujjayanta Palace covering one sq km. was built by Radhakishore Manikya Bahadur in 1901. Two large tanks lie in front of the palace and in the intervening space a beautiful Mughal garden has been laid out. The magnificent tiles floors, ceiling of the Chinse room crafted by artisans brought from China, of the palace which now houses the State Legislative Assembly, may give some idea of the opulence and splendour of the original setting of the building. It has recently been adorned with a spectacular musical fountain at its foreyard. 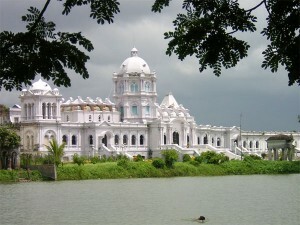 This entry was posted in Tripura, Ujjayanta Palace and tagged Palace. Bookmark the permalink.